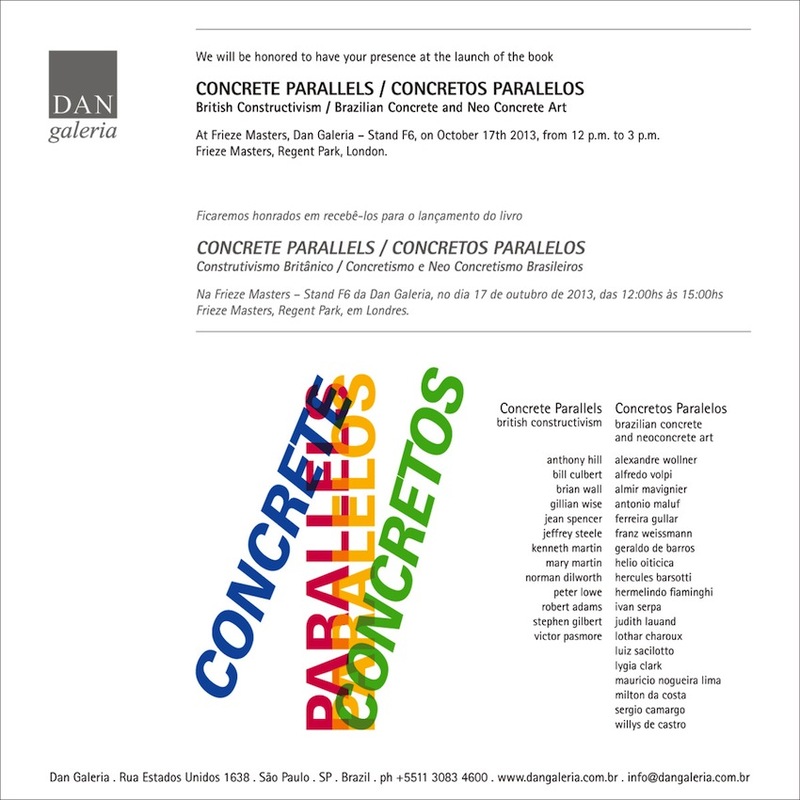 The publication is a 374 pages fully illustrated catalogue of the exhibition Concrete Parallels / Concretos Paralelos, with essays by Sam Gathercole, Maria Alice Milliet, Ferreira Gullar, Jon Wood and Gloria Carnevali. Concrete Parallels / Concretos Paralelos was held at the Centro Brasileiro Britânico, São Paulo, from 4th September to 2nd December 2012, during the São Paulo Biennale. This landmark exhibition is the result of the collaboration between Dan Galeria, Laurent Delaye Gallery, Alexandra Mollof and Paulo Petrarca. Over the last six years, Laurent Delaye Gallery has been promoting and representing the British artists known as Constructivists and Systems Group. This is the first exhibition of any scale to consider the parallel practices of ‘concrete’ and ‘constructive’ art in Britain and Brazil from the 1950s to the 1970s. Catalogue available to purchase at the Dan Galeria, Frieze Masters, stand F6, and at the Laurent Delaye Gallery. This entry was posted on 16 October 2013 by Laurent Delaye in Anthony Hill, Bill Culbert, Brian Wall, Gillian Wise, Jean Spencer, Jeffrey Steele, Kenneth Martin, Mary Martin, News, Norman Dilworth, Peter Lowe, Robert Adams, Stephen Gilbert, Victor Pasmore and tagged british artist, British Concrete Art, concrete parallels, frieze masters, Laurent Delaye.